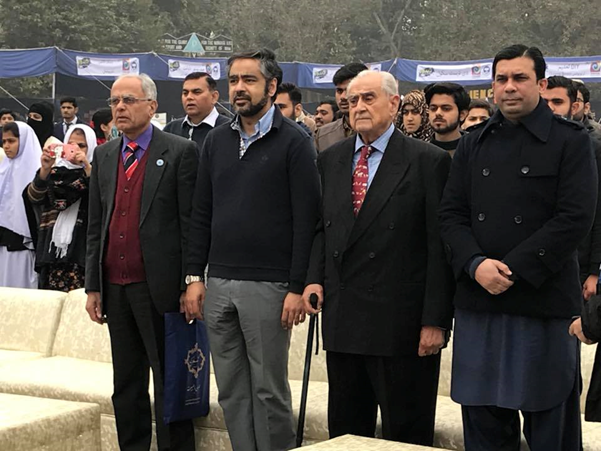 A two-day Lahore Science Mela (Festival) organized by the Khwarizmi Science Society in collaboration with the Ali Institute of Education, ECO Science Foundation (ECOSF) and with the support of the great Philanthropist Syed Babar Ali was held in Lahore on January 27-28, 2018. Thousands of students, science enthusiasts and scientists participated in the Lahore Science Mela (Science Fair). It was attended by students from government and private educational institutions, over 70 exhibits including science models made by students were showcased during the festival. The Science Mela aimed to encourage children and adults to explore and celebrate scientific discoveries and milestones in Pakistan. 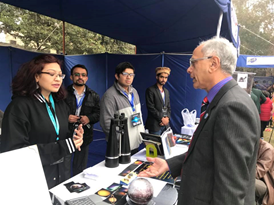 President ECOSF Prof. Dr. Manzoor H. Soomro participated in the Science Mela, where he visited various exhibits and interacted with science enthusiasts and participating teams from all across the country. It is pertinent to mention here that the Science Mela is a brain child of Dr. Sabieh Anwar of Lahore University of Management Sciences (LUMS) and Dr. M. Hamid Zaman from Boston USA, welcomed by Dr. Saadat Anwar Siddiqi the President of Khwarizmi Science Society Lahore, all of whom also participated in the event. During the Mela President ECOSF Prof. Dr. Manzoor H. Soomro also interacted with Syed Babar Ali and other science enthusiasts. It is important to mention here that ECOSF sponsored participation of two Mathematicians from Isfahan Mathematics House, Iran who displayed interactive Maths games and puzzles that children enjoyed and learnt the principles of Mathematics as a fun activity. It is hoped this first interaction of Iranian colleagues will lead to collaboration in the area. The visiting mathematicians from Iran will not only inspire young scientists, but also enlighten science students about theoretical and practical aspects of mathematics. As mathematics is considered to be a dry subject, it is one of the most important sciences and if taught well many children can be attracted to it. It is important to mention here that Lahore is a sister city of Isfahan in Iran. Isfahan is called as “Nisf Jahan” meaning half of the world. During the event, students and participating teams representing a number of universities of Pakistan displayed an array of projects developed by engineering students, including autonomous wireless quadcopter, LED cube, self-balancing robots and robotic claw, at the event. Organisations such as Pakistan Science Club, PCSIR, Lahore Astronomical Society, The Planetary Society, Allama Iqbal Medical College, Government College Lahore and CECOS University, Peshawar also took part in the festival.